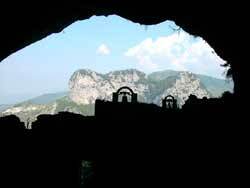 In the green landscape of the Alburni mountain of the CilentoNational Park, between the villages of Auletta and Pertosa located at 70 km (about 43 miles) from Salerno, in an attractive natural amphitheatre lie s the Angel or Pertosa Caves. 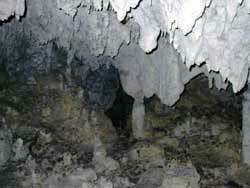 Recent research dates the origin of the cave to about 34 million years ago. 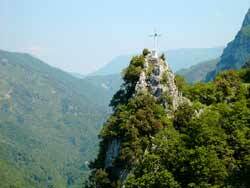 Numerous traces show that they were lived in up until the stone age; the Greeks and Romans assigned the cave as a seat of cult and finally the Christians consecrated the caves to St. Michael Archangel. The Angel Caves of Pertosa unwind for about 2,500 mt across tunnels and immense caverns; they are characterised by the beauty of their stalact and stalagmite conformation, for the impressiv eness of the caverns, and because they are unique in Italy. To visit the caves one must cross an underground river. A boat wisely guided into the depths of the earth for some 100 m, in a silence which is broken only by the sound of water and exclamations of surprise. After a few minutes the boat berths and the enchantment begins. A wonderful waterfall created by the Black River echoes distan t times, stalacts and drapes of candid alabaster hang from the vaults of the caverns, stalagmites of strange shapes capture incredulous gazes, one walks through tunnels and arabesque corridors lit by the subtle play of light into vast salons each of which has a name, and one meets with the incredible concretion which nature has created throughout millions of years. 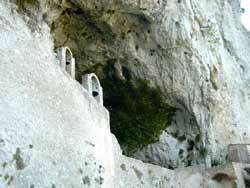 The Angel Caves are easy to reach taking the A3 highway Salerno-Reggio Calabria exiting at Petina or the national Calabria road. 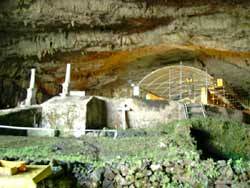 At about 200 m from the entrance to the caves there is an ample car park and without ruining the natural beauty of the surrounding landscape there are also restaurants where one can taste the delicious local cuisine.